Ramble Writer would like to extend a special thanks to our new sponsor, San Telmo Loft, located in barrio San Telmo, Buenos Aires. Nick and I had the pleasure of staying in The Pad, a two bedroom apartment with a patio, as well as the Loft, an studio apartment located in the same building. San Telmo Loft apartments are colorful and funky, providing not only a comfortable and homey atmosphere, but also little extras such as cable TV, a cell phone with prepaid minutes, wi-fi, magazines, Argentina guidebooks, and a fully stocked kitchen, right down to the maté cups and bombillas. Angela, who manages the Loft and The Pad and lives in the same building, serves as almost a hostess, providing informational sheets about Buenos Aires, a quick tour of the neighborhood, and a readiness to answer any questions you may have about San Telmo and Argentine culture in general. She was also very welcoming toward Domino, which is always an added bonus on the Ramble Writer accommodations checklist! If you plan to stay in Buenos Aires for a week or more, I strongly recommend renting an apartment as opposed to sleeping at a hostel or hotel. The price for two people per night is comparable and often cheaper, and the perks include a complete and private living space, furnished accommodations, and, in the case of San Telmo Loft, artistically decorated rooms and beautiful antique fixtures. 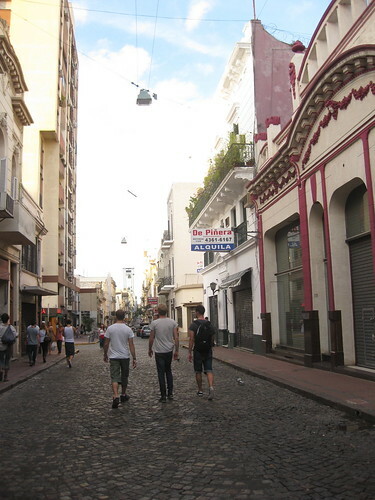 The cobblestone streets, crumbling and renovated historic buildings, and artsy vibe make San Telmo one of Buenos Aires’ most popular tourist areas. Many years ago this neighborhood was at the bottom portenos’ list of places to live, but a recent rejuvenation has beckoned artisans, designers, and restaurant owners to reclaim these once-weary streets. Make sure not to miss it’s famous Antique Fair on Sundays, which brings crowds of people to Plaza Dorrego. 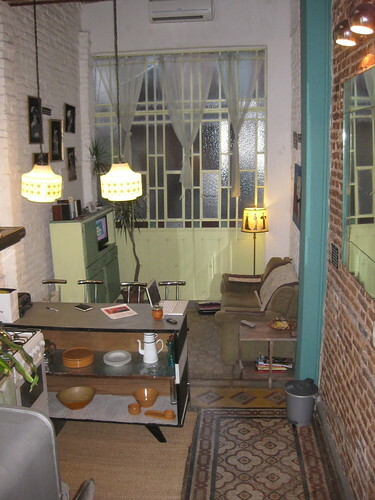 To learn more about San Telmo Loft, visit www.santelmoloft.com. This entry was written by admin and posted on February 23, 2010 at 2:47 pm and filed under Accommodations, Argentina. Bookmark the permalink. Follow any comments here with the RSS feed for this post. Post a comment(Latest is displayed first) or leave a trackback: Trackback URL. 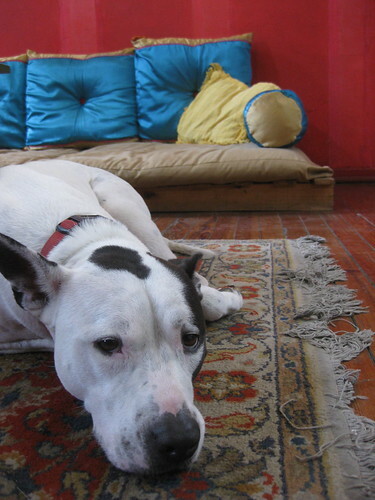 I love that picture of Domino in the Loft! So glad to have met you guys and had you here with us in San Telmo. Un abrazo a los tres!